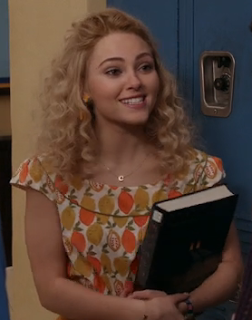 Did everyone catch the Carrie Diaries Season Finale? Did it feel to anyone else like a Series Finale? We are hoping not, because we would sure like to see it come back next year! MamaBreak received compensation for this post. It is a paid advertisement. We LOVE all of the super cute clothing, especially from Mod Cloth! Carrie Bradshaw cannot get enough of the great styles at ModCloth! 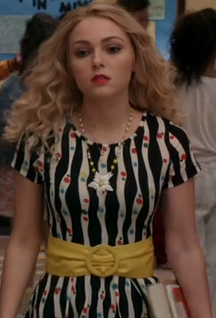 During the season finale of The Carrie Diaries, Carrie not only wears one but three different pieces from the site. The first piece she wears is the Tilt-A-Twirl Dress from ModCloth. Crafted in a classic silhouette, this darling dress features cap sleeves, a full skirt, and a vibrant pattern of black, cream, blue, red, yellow, and green. Next Carrie wears the Music in Me Skirt in Mix Tape from ModCloth. This A-line skirt features bright cassette tapes set on a black backdrop that form a fabulous bold pattern. Finally Carrie can be seen in the Cool With Me Top in Citrus from ModCloth featuring cap sleeves, a defined waist, and a fruity, retro print. We LOVE this top!!!! Check out all of these great styles on Episode 113: "Kiss Yesterday Goodbye" and visit ModCloth to dress like Carrie today!